Want to find a large assortment of doors, windows, and the hardware that go with them? You can purchase these fixtures from the highly rated Intex Windows & Doors. You will not have to worry about finding something that is ideal for your next Windows Replacement in Hollywood Hills. Look for one that is similar to a model that you already have in your house, or you can opt for a new style that complements the architecture of your home. Also, you can spring for something that is entirely unique, if that is what you wish. The great thing about Intex is that there is no stress involved with the shopping process. You can avoid the hard work of driving around to different warehouses and show rooms, dealing with assertive salespeople, and having a somewhat limited array of choices. Here at Intex Windows & Doors, we do sell products from certain brands, though we also offer custom-made fixtures. You can talk to an agent about your ideas in order to have something crafted that is just like what you imagine. Though we have a wide selection, we realize that sometimes it is not possible to find the unique specifications that are suited to your property. This process can go smoothly when you have a company like Intex to assist you with it. If you need a Windows Replacement in La Canada Flintridge, you will do well to shop from Intex. 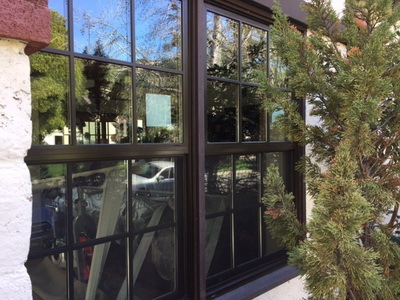 Find many different models, including specialty windows with sound proofing features that are ideal for use in a music studio or if you would like to drown out the noise when you live on a busy city street, as well as the ever-popular Milgard Tuscany Windows. Intex Windows & Doors is a business on which you can depend, no matter how large or small the project. All of the fixtures that are sold by Intex have been designed by master craftsmen who have many years of experience in the field. Their names carry a great deal of weight, so you will not have to be concerned about the quality of the products that you buy. However, there is a complication when it comes to putting in a Windows Replacement in Hollywood Hills. This requires you to have a permit before any work begins for installation. The town or city where you live likely has a process that you have to go through in order to have the fixture and project approved. Make sure that you obtain what is needed prior to having one of the Intex technicians comes out to do this work. That way, there will be no service interruptions and no headaches involved, and the work can get done efficiently. For amazing style at excellent prices that cannot be beat, give Intex Windows & Doors a try. You will be happy with your choice when you see the windows and/or doors installed in your very own home or commercial property. Contact Intex by phone or through the form on the website today to be able to start the whole process.